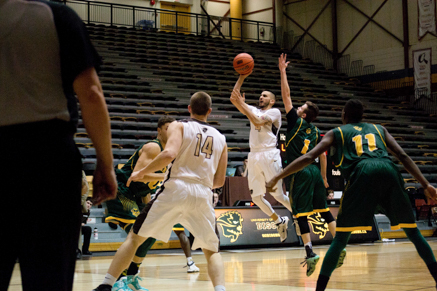 The University of Manitoba men’s basketball team was in Langley, B.C. this weekend, taking on the Trinity Western Spartans in a two-game series. The Bisons opened the weekend with a 108-76 win on Friday night, and completed the weekend sweep with a 115-91 victory on Saturday. With the two wins, Manitoba improves to 8-6 this season, and extends their winning streak to six games, while the Spartans drop to 2-12 in conference play. Manitoba opened the weekend with a dominating 108-76 victory over the Spartans. The win was powered by Justus Alleyn’s 20 points, as well as James Wagner (18) and Joey Nitychoruk (16) who also contributed big points to help lead the herd to victory. Trinity Western was led by Pogos Trunyan, who was able to net a game-high 24 points for his team. The lopsided score was due in part to Manitoba shooting 58.5 per cent from the field, compared to the Spartans’ poor 38.6 per cent. The visiting Bisons got off to a quick start, as they connected on their first three shot attempts and opened with an 8-0 run. The herd performed well the rest of the first quarter, connecting on over 60 per cent of the shots in the frame, which allowed them to build a 29-18 first quarter lead. They continued to roll in the second, and were able to go on a 14-0 run within the frame. The Bisons were able to take a 57-29 lead into halftime, led by Alleyn’s 12 points and Wagner’s 10. The herd was able to build a 37-point lead with just over two minutes to play in the third quarter, but the Spartans finally responded, and ended the frame on an 11-3 run, cutting the lead to 29 points. The fourth quarter was competitive, with the two teams shooting the ball well and exchanging looks throughout the frame. Manitoba’s mammoth first half lead was just too much for the Spartans to overcome, though, and the Bisons rolled to a major victory. Nitychoruk led Manitoba’s second half effort with nine points, while Alleyn and Wagner each added another eight. The Bisons completed the weekend sweep on Saturday, with a 115-91 win against the Spartans. Ilarion Bonhomme led the way for Manitoba, scoring 24 points and adding seven assists. Team captains AJ Basi (21) and Alleyn (19) also filled the net on the way to victory. Trinity Western jumped to an early 8-4 lead, before the Bisons responded with a 9-0 run, contributing to the 10-point lead the herd was able to carry into the second quarter. Both teams shot over 50 per cent from the field in the opening half, and four players got into double-digits in the first half for the herd: Bonhomme scored 15 points, Basi 13, Alleyn 12, and Keith Omoerah 11. Manitoba created more separation in the third quarter, by going on runs of 8-0 and 9-0 in the frame, which led to a 92-68 lead as they entered the final quarter of play. The Bisons slowed the pace down in the fourth; both teams scored 23 points, but their early lead ensured the Bisons came out on top with their sixth-straight conference victory. The Bisons return home for a two-game series on Jan. 27-28, when they host the UNBC Timberwolves.